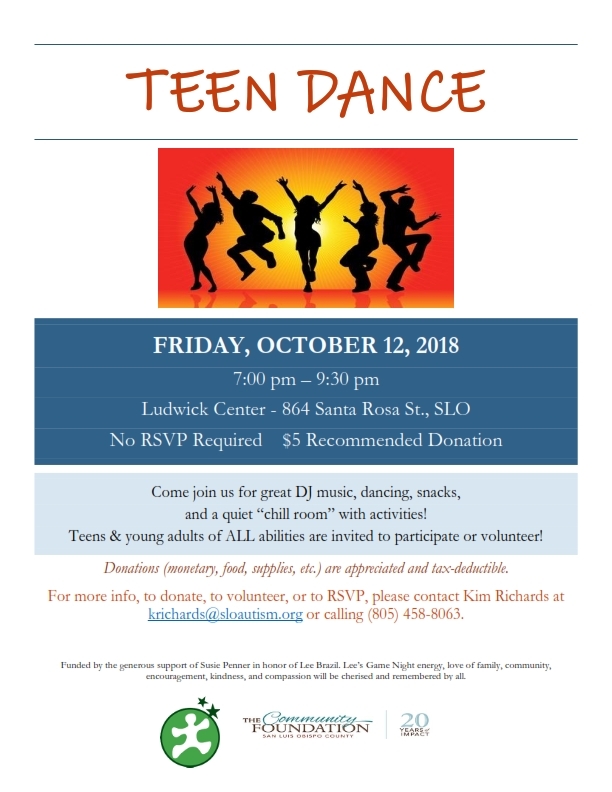 Come join teens of ALL abilities for the Fall Teen Dance! There will be great music, dancing, snacks, and a “Chill Room” with quiet activities. No RSVP required – bring friends! $5 suggested donation. For more information, or to participate in the planning meeting on 10/7/18, please contact Kim Richards at [email protected] or (805) 458-8063 Volunteers and donations (monetary, food, supplies, etc.) are welcome and tax deductible! Brought to you by The Central Coast Autism Spectrum Center, The Community Foundation of SLO, and Epic Entertainment. Game Nights/Teen and Young Adult activities are funded via the generous support of Board Member Emeritus Susie Penner in honor of Lee Brazil. Lee’s Game Night energy, love of family, community, encouragement, kindness and compassion will be fondly remembered and cherished by all.